click image for close-up Following Gabriel's Conspiracy in 1800, when the state of Virginia reimbursed slaveowners for the full value of slaves who were executed or exported, the average price of a healthy young field hand was $333, while a literate or highly skilled slave might bring as much as $500. With the invention of the cotton gin in 1793 and the prohibition of the international slave trade in 1808, the price of slaves increased dramatically through mid-century. Virginia, which had been highly productive when tobacco was profitable, saved itself from financial ruin by meeting the increased demand for slave labor in the new Southern states. 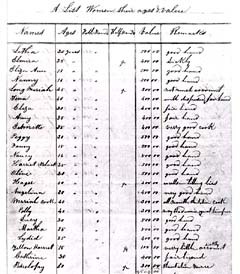 As shown on these 1849 records from the Wilton plantation in Louisiana, slaves in their 20s who were regarded as a "good" or even "fair hand" were routinely valued at $700 or $800. Wilton was a sugar plantation that also grew corn and had a sawmill and cooper's shop. Wilton was owned by James Alexander Seddon and James Coles Bruce, both of Virginia, and Dr. William Webb Wilkins of Louisiana. The partners, who were related by marriage, also owned another plantation in Louisiana called "Ashton," which grew cotton. Bruce's father was described as the third wealthiest man in America at the time of his death in 1839. Most of the Bruce family plantations were in Virginia and North Carolina, except for these two owned in partnership with Seddon and Wilkins. Seddon served in the U.S. Congress and was Secretary of War for the Confederacy, under President Jefferson Davis.